Cheers: Works exactly as advertised; Can be locked into preset position for repeatable results; High quality construction. There are several instances during the course of constructing an RV where you need to form the edge of a skin. 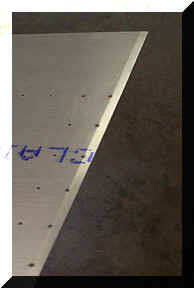 If the skins overlap, and the top skin does not have the edge "rolled" down slightly, often that edge will lift sufficiently to be unsightly after the skins are riveted together. There are a couple of homebrew methods of forming the edge. One involves a piece of wood with a narrow slot cut with a saw. 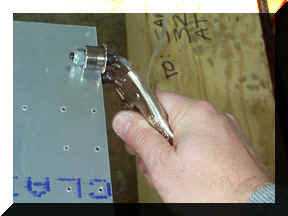 The skin is inserted into the slot and bent until the desired bevel is formed on the edge. While workable, this method is very tedious and difficult to repeat consistently. Another method uses a commercially available product that has a couple of rollers. This tool works fairly well if you can maintain a constant angle of attack on the edge as you move the rollers down the edge of the skin. Once again, getting consistent results is the problem. The Edge Former (EF60) from Cleaveland Aircraft Tool is the slickest solution to this problem I have seen yet. 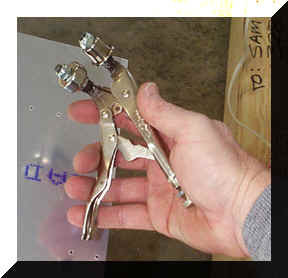 The basis of the Former is a small pair of vice-grip type pliers that have two rollers attached to the jaws. The upper roller has an angle which forms the bevel as you pull the tool along the edge of the skin. The pliers adjustment screw includes a locknut so you can lock down the setting you find that works properly on a particular thickness of skin stock. The construction appears to be very high quality, and the rollers have a highly polished finish. To use the tool, adjust the screw for a light clamping pressure; Too tight, and you will have difficulty pulling the tool. Too loose, and the tool will slip off the edge of the skin. 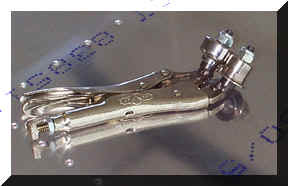 When properly adjusted, the tool will stay on the edge of the skin with very little guiding required. Pull the tool along the edge, keeping the edge of the skin up against the stop on the upper roller (this assumes you are right-handed.....). I tried the tool on a scrap sheet, and intentionally tried to mess up the edge; This thing is practically idiot proof! If you don't get a great bevel on the edge, the tool is either too tight to pull, or too loose to do any damage. The bevel that is formed is very slight, but sufficient to prevent the uglies when you rivet the skins together. I had to play around with the lighting angle to get the following photo so you can see the bevel. Conclusion: This tool is a must-have for the RV builder who is willing to spend a few bucks for a high quality tool that will be used several times on his project. There are several places on an RV where skins overlap, and many of them are very visible. I can't imagine a tool that will put a nicer edge on these important areas.